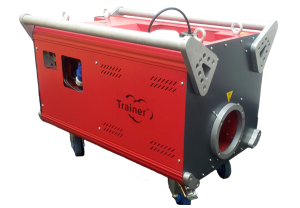 Designed to generate instant smoke in very large spaces, the Trainer 2500 combines a unique range of features to create a variety of powerful smoke effects. Water resistant, the Hi-Mass Vaporizing System guarantees even more output for longer periods, while maximum efficiency is still achieved. The unit produces a massive 2500 cubic metres of dense smoke per minute. A 9.5 litre container ensures long operational periods without refilling. An on-board remote is also included, offering an auto-timer function, extendable by the 8x-mode function. The smooth 0 – 100% smoke output allows precision atmospheric control. Click to view Heat Exchanger: 2x1500w with 9 minute heating time and overheat Protection. Coverage: 2500 Cubic meters per Min and rated continuous (at lower Output). Control: Smoke control with on board multifunctional timer output level control. Removal controller with built in 5 metre control lead. Timer Control: Adjustable auto timer with 2 second operation and 1 second delay settings. Size: (LxHxW) 800mm x 500mm x 600mm. Fluid Types: Heavy or Medium.